Calling all seafood lovers! Enjoy the exclusive recipe of delicious steamed prawns with vermicelli and garlic by Chef Nguyen Van Tuan (May Man Cuisine, Fortuna Hotel Ha Noi). Soak vermicelli in water until it is soft. Cook it in boiling water and then rinse with cold water. Drain and place it on a steaming plate. Rinse prawns. Remove prawn feelers and legs. Cut into halves and de-vein. Place prawns onto the vermicelli. Heat up the oil to fry the garlic with spices. Place fried garlic mixture on the prawns and steam prawns at high heat for about 5 minutes. Turn off heat and pour sauces evenly on the steamed prawn. Ready to serve. 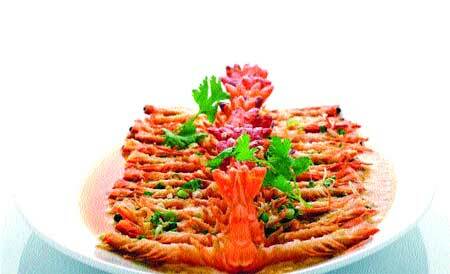 You can sample the dish at Fortuna Hotel Ha Noi, 6B Lang Ha St, Ba Dinh Dist, Ha Noi. Tel. 84.4. 3831 3333, ext 6413.